Tengdea is able to manage the whole procedure from concept of the very beginning to perfect completion. This means higher efficiency, lower cost, shorter lead-time and much better overall control of the operation. We will make detailed production planning and timing which are followed up strictly by project managers who are rich experienced in mould design, tooling manufacture, injection molding process management. Each project is separately charged by one Project manager. He also is in charge of all business and technical communication for this project with customer. We will keep customer updated about detail information of this project by weekly report and digital picture. It is easy for customer to manage the project at the same time. We will provide high standard of customer service by self-improvement. Just one phone call, or an e-mail, and you'll see we are ready for you at 24/7. We setup an efficient team to ensure that projects development transit smoothly from engineering to production or client. Customer RFQ:Request for quotation with product drawings, samples or just concept. 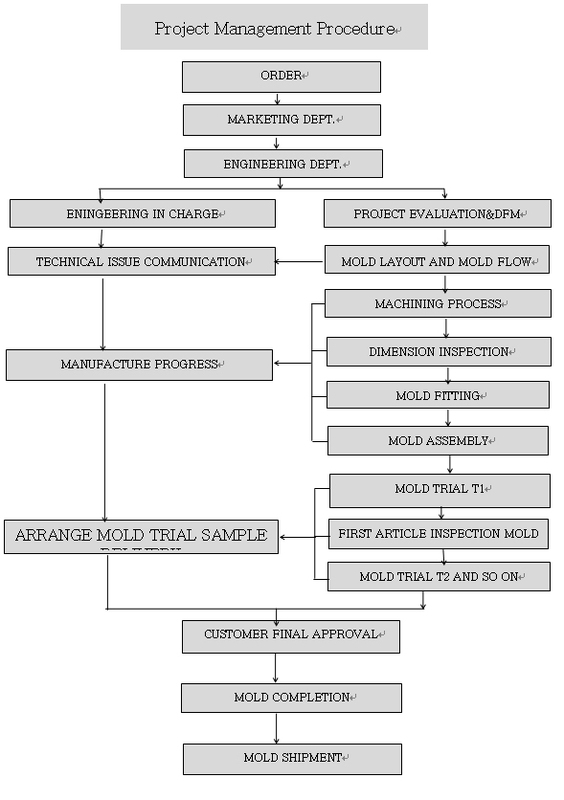 Detailed Design:Mold components with detail drawings. Drawing Final Confirmation:Drawings are finally confirmed by customer. Mould Manufacture:Mould manufacture on schedule. Mould Trial Running and Samples Submitted:Mould trial running on schedule, and Samples are submitted with a detailed inspection report. Sample Confirmation:After inspected final samples according to specifications customer make a confirmation. Delivery:Paperwork and a CD of assembly drawings are sent to customer at the time of the shipment of the mould.